Above, left to right: Rosemary, Basil, Blood Orange, Persian Lime, Meyer Lemon and Extra Virgin Olive Oils. Real Food for Real People: Assaggiare Mendocino brings the best-kept secrets of Northern California Wine Country foods to your table. Chef and author John Ash is “a devoted fan! ...Stella Cadente’s winning the Best of Show at the Oils of the World Competition is equivalent to winning Best Picture at the Academy Awards." The name Stella Cadente sounds romantic, even if one doesn’t know that it means “shooting star” in Italian. Away from city lights in the Anderson Valley of Mendocino County the nights are very dark, and the summer months bring a spectacular display of shooting stars. This was founders Sue Ellery and Tom Hunter’s inspiration for the name of Shooting Star Ranch and Stella Cadente Olive Oil. 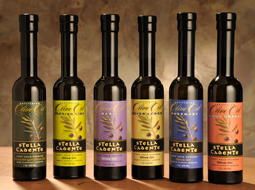 From these proud roots, Stella Cadente has grown to become the premier source for oils produced from Mendocino County’s unmatched Tuscan-style olives. Today, many of the olives are sourced from small family farms and wineries in the hills and valleys of the county, produced sustainably and independently, as are many of the regions well-known wines. The newest member of the Stella Cadente family is Mendocino County chef Julia Kendrick Conway. 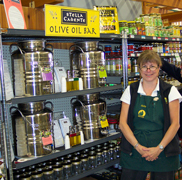 A devoted fan of Stella Cadente’s oils from her tenure as a manager at a local specialty food store, Julia was a natural choice to take the company to the next level. With culinary training from the Napa Valley’s Culinary Institute of America at Greystone, and at a farm school in Tuscany, Julia brings a cook’s perspective and palate to product development and marketing. A favorite of local and San Francisco Bay area chefs alike, Stella Cadente is often a feature of special dinners, wine tastings and cooking demonstrations. Club Stella memberships, the ultimate gift for olive-oil lovers, can be purchased on the site. Recipes on the site have been contributed by chefs, staff, and customers.